Fantasy Amusement Park is the first amusement park in the state of Kerala and is known for its state of the art online testing and monitoring of water quality to keep it 100% pure always. Read more to know about the details, rates, timings, address, official website, rides and facilities of Fantasy Amusement Park. 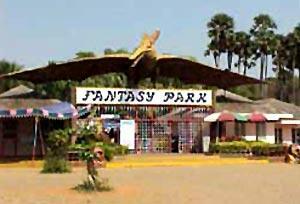 Fantasy Amusement Park is located close to the Malampuzha gardens in Palakkad district of Kerala and has to its credit of being the first amusement park in Kerala opened in the year 1996. Having a total area of 15 acres, it is not a very huge park compared to the other amusement parks in Kerala but it is still as exciting and enjoyable as the others. The park offers both dry rides as well as water rides for the visitors suitable for all age groups. The park takes all the necessary actions to make sure that the water used in the rides are of the best quality and 100% pure. This amusement park is also an ideal spot for family picnics. Fantasy Amusement Park was created and designed by Neo Tech Amusements and Resorts (P) Ltd for which it also won the Best Innovative Tourism Product in the state award by Kerala Tourism in 1998. One of the unique features of Fantasy Amusement Park is its digital Planetarium which is a mesmerising section displaying images of the stars, sun, moon and other celestial objects. It is a very educational place for the young ones inspiring them to learn more about astronomy and space. The view of Earth as seen from the moon can also be witnessed inside this planetarium. It is definitely an added attraction as well as an educational concept. Tranquillity prevails in the premises of this park with its beautifully designed gardens and fountains. Some of the rides offered by Fantasy Amusement Park includes Super Splash, Hara Kiri, Zip Zap Zoop, Striking cars, Dragon coaster, Pirate boat, Tora Tora, Water Merry Go Round and Para Trooper. Fantasy park also has one of the largest wave pools in Kerala to ensure that your trip is filled with utmost excitement and thrills. The Simulator games seen at this amusement park are the largest in South India and includes 29 high class stimulator games. The rides meant mainly for kids are Jumping Horse, Scooter ride, Mini Tele combat, Caterpillar and Jumping Castle. Even the tiny tots can enjoy at this park as there are few rides meant especially for them such as Baby trains, Water kiddie rides and coin operated games. Some of the facilities provided by this park include restaurants, icecream parlours, dormitories, parking area, curio corner, video games complex etc. Special discounts are offered for student packages, colleges and family packages. 20% discount is given for a family group of 20 and above. This article is about the 'Vismaya' water theme park located at the Kannur district of Kerala. This is located at Parassinikadavu. It is developed by Malabar Tourism Development Corporation.It is opened in 2008. Silver Storm Water Theme park is located in Thrissur district of Kerala. It is one of renowned water theme parks in South India and is famous for its unique designs in creating some of the first-of-its-kind rides in South India. Read more to know about the information, rides available, facilities provided, timings, rates and contact address of Silver Storm Water Theme Amusement Park. Sadhoo Merry Kingdom Amusement park is one of the most modern man made sophisticated water theme park in Kerala and offers exciting rides and basic necessities to the visitors. Read more to know the details, rides available, timings, rates, address, facilities and official website of Sadhoo Merry Kingdom Kannur. 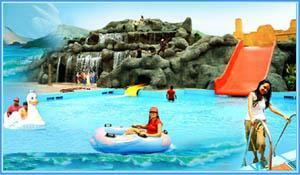 Dream World Water Park is located in Chalakudy of Thrissur district in Kerala. It is a modern sophisticated water park with world class facilities and filtration methods to purify the water. Read more to know the details, rides available, timings, rates, attractions, facilities, address and official website of Dream World Water Park. Amusement Parks are some of the most preferred tourist attractions on a vacation as it is exciting for people of all age groups. Kerala has several amusement parks and theme parks to offer. All the parks have been modernised with world class facilities and special discounts. Read more to know the details of all the amusement parks in Kerala.